The recent reports claim that Apple has finalized quality assurance examination on iOS 5.1 and will announce it together with the iPad 3 in just several hours’ time. The new version of iOS is said to comprise an augmented lock screen that gives easier admission to the camera, Japanese support for Siri – as previously rumored - and two more new features that have yet to be exposed. 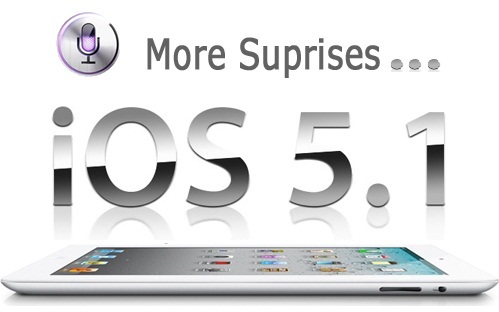 Although there are no actual evidences about what remains to be seen, the rumors have spread that there is at least one major feature of the iPad 3 that is yet to be unveiled and that was causing a delay in the launch of new beta versions of iOS 5.1. There have even been some attempts at guesstimating what it might be here. Will it be Siri, Retina display requiring additional work to be ready or any new feature – will be unveiled soon, very soon. On the other hand some reports claim that the build number of iOS 5.1 Gold Master is 9B176, which surprisingly has soon been signed by Apple yet. This confirms that any leaked screenshot would have to come from an official device authorized for testing. However, suspends our belief to see any glimpses till the actual event… As soon as iOS 5.1 is allegedly planned for release in the ‘coming days’ it is quite rational to conjecture that the update will be rolled after the iPad 3 announcement, but before it goes on sale.